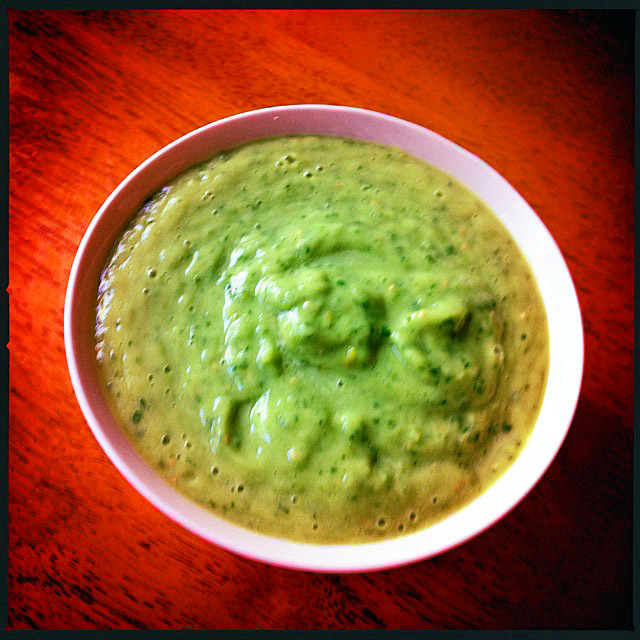 Combine the tomatillos, yellow tomatoes, avocado, cilantro, chile, and lemon juice in a blender and puree until smooth. Season the salsa with salt and pepper, to taste. Transfer to a serving bowl, cover and refrigerate for up to 2 hours or until ready to use. I intend to make her chicken tostadas soon, my problem is the tostada part, as we still don’t have a gas cooktop. But I might improvise and come up with an alternative. Tomatillos are usually cooked before incorporation into salsas and sauces, but in this fresh preparation the trick is to mellow their sharpness down by adding the avocado and using lemon juice instead of lime juice, as most salsas would call for. Simple. Brilliant. I totally agree with you Marcela is a breath of freshness in a mostly stale format! I’ve adapted a few of her recipes for my Mexican loving clients. 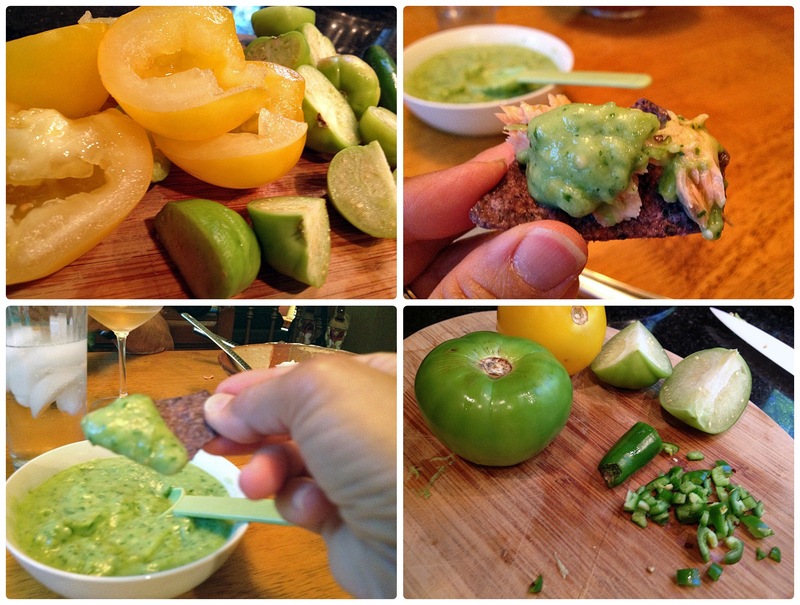 I have made roasted tomatillo salsa many times, will definitely try the raw version soon! Oh man, Twisted Pigeon was, like, my FAVORITE hair band back in the 80’s! Great to see that they’re still around. Rock on, bird-men!! Thanks so much for the mention Sally! That is quite a coincidence cyber sister… both of us being inspired by these lovely yoginis ;-). You’re right, this salsa would work magic on just about anything…and so simple too – love that! 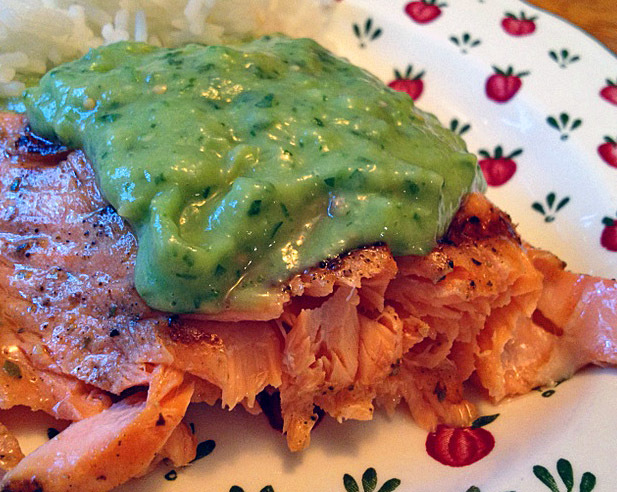 It looks great atop your fish by the way… creamy delicious. I’m off to the gym this morning and then in search of tomatillos… Can you believe I’ve never watched the Food Network?! Well, guess what I’m getting ready to do? P90X Yoga!!!! No better way to launch the weekend, as far as I’m concerned…. Marcela is from San Diego, and that’s always a good thing! This condiment, especially when prepared with a serious kick of fresh green jalapeno or serrano is very popular in the southwest -especially authentic Mexican kitchens. We love it! Thanks Sally. There you go, cannot go wrong if you are from San Diego! Such a great city, we considered it as one place for the sabbatical a couple of years ago, but ended in Los Angeles instead. In the mid-nineties, when our cable company started carrying The Food Network, it was a joy, but that was long ago now. I love the combination of avocado and tomatillos, Sally, and have never watched this show since I no longer watch TFN. I’ll look for Marcela, thanks to you. Marcia, I hope you can get to see her show, I have the feeling you will like her very much. Great condiment – so simple and fresh. I like the use of raw tomatillos. It was my first time using tomatillos, actually. Next I will do the roasted tomatillo salsa, per Jim’s recommendation. at any rate, I probably cannot do either. The Warrior III yes, is a favorite of mine, but I say no to the birds. Que bom te “ver” aqui, Angela… espero que tudo esteja caminhando cada vez melhor para voce! Beijao! I’m getting inspired for lots of creative uses for this!!! I’d start just as you did on top of fish! I’ve made something similiar, though roasting the tomatillas first… how much quicker your method is!! Note to make extra just for Phil’s chip idea!!! I am very fond of guacamole type things on top of fish – come to think of it, I am an avocado-addict, and got into it thanks to Phil… and he is very fond of tomatoes now thanks to me. AH, the mysteries of love! I am calling husk the papery cover indeed – once you remove it, you will feel a sort of sticky substance, not too thick, barely noticeable, but definitely there. I wash each one well in warm water until I don’t feel it sticking to my fingers anymore. The actual skin of the tomatillo you don’t need to worry about.